MATCH: Stags 3 Spurs 3. VENUE: Field Mill, 25th March 1978. Most footballers getting ready to face Tottenham Hotspur spend the week ahead of the game training hard with their team-mates perfecting their own fitness levels and fine-tuning team game plans. But for one Mansfield Town footballer back in March 1978, the build-up against the mighty London side was an all too different affair. Stags were enjoying their first and only season at what is now Championship level, and went into the contest needing three points as they continued their battle to avoid relegation. And, while his team-mates got their minds focused on the task ahead, defender Kevin Bird’s only concern that morning was not having too much to drink. “I had been out injured for the previous three months and had only started training for the first time on the Friday,” said Kevin, who went on to make 463 appearances for the club between 1972 and 1983. “On the morning of the game I went into the Park Hall Tavern in Mansfield Woodhouse for a couple of pints and found out I was playing while I was there. The mighty Spurs side, which featured a young Glenn Hoddle and Peter Taylor, found the minnows of Mansfield a rather tougher nut to crack than expected as Stags battled hard during a ferocious Nottinghamshire downpour. Stags entered the game against the Londoners without a win or a goal to their name in their last five outings but, just as they had done at Christmas during the 1-1 draw at White Hart Lane, raised their game in impressive fashion with Dave Syrett grabbing the headlines thanks to his first ever hat-trick. It was Stags who hit the front first with Kevin Bird providing the build-up for the 29th minute opener. Martin headed back the full-back’s cross allowing Syrett to sweep the ball home and register Mansfield’s first goal in almost eight hours of football. But the hard-earned advantage was wiped out after just 60 seconds by Chris Jones, despite the best efforts of Rod Arnold in the home goal. On the mud-drenched pitch, both sides delivered a contest to live long in the memory with the end-to-end match producing the highest drama. For Kevin, the waterlogged pitch was good news for his underdog team, but a real tester for his lowly fitness levels. Said Kevin: “The pitch was waterlogged and there is no way the game would have been played today. It was classic 1970’s football, but the bad pitch helped us by hindering Spurs’ flowing passing football. 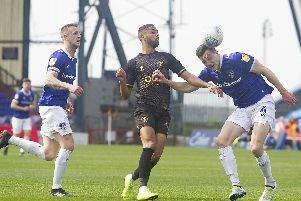 Stags should have re-asserted their lead in the first half, but Dennis Martin was unable to fire home from the spot - a failing which would haunt Mansfield Town throughout the long season. But five minutes later the brave home team, roared on by the bumper gate, were justifiably ahead once again when Colin Foster headed into the path of Syrett, who took care of the rest with a neat finish. The Stags began to lose the midfield battle during parts of the second-half as the inspirational Glenn Hoddle showed glimpses of the majestic player he was to become. And it was no surprise when Spurs levelled the gripping contest in the final nine minutes when Hoddle calmly slotted home a controversial penalty, in which Mansfield’s Ian Wood was ruled to have handled the ball. Far from dropping their heads, Stags showed a never-say-die attitute to come roaring back at their famous rivals as Dave Syrett completed his hat-trick in the 85th minute. But, as with many modern day Mansfield home games, the Field Mill faithful were left wondering what might have been had their beloved side taken their chances. Spurs shot-stopper Barry Daines sliced an attempted clearance badly wrong into the path of Syrett. Syrett only had to keep his head to give Stags an unbeatable two goal cushion, but amazingly he fluffed this golden opportunity. And Mansfield were made to pay a dear price as the classy Glenn Hoddle silenced the home fans in the final minute with a magnificent free-kick from right on the edge of the penalty area to deny Mansfield two vital points. It was a bitter blow for all concerned and left Kevin to reflect on another missed opportunity. “We should have won that game,” he said. “The goal by Hoddle was a very good goal. Spurs had some excellent players that day. “We missed seven or eight penalties that year and maybe that was the difference between us staying up and going down. “We were struggling at times during that season, but we gave the Spurs team a real good game. More than three decades after the iconic match, Stags fan Andy Newbury, who was 15 at the time, still remembers the excitement generated by the fixture. He said: “I was only 15 at the time but it is a game I will never forget. We had a tough time when we got promoted to what is now The Championship, but it was very exciting seeing the big names in the Spurs team such as a young Glenn Hoddle coming to town. “We had got a good result down at White Hart Lane and it was a big occasion for the club. “The weather was chucking it down and the fans in the North Stand were all huddled together to stay out of the rain. For Andy, Hoddle’s classy strike marked the beginning of the end for Mansfield Town’s survival hopes. Said Andy: “When Hoddle took that free-kick we just knew he would score. We were all absolutely gutted when they equalised. MANSFIELD TOWN: Arnold, Bird, Wood, C. Foster. P. Sharkey, Syrett, Hodgson, Miller, M. Saxby, B. Foster, Martin.